A red, gem variety of corundum. The red colour is caused by minor amounts of trivalent Cr replacing Al in the crystal structure. In traditional gemmological terms, ruby has to be blood-red and of clear, facetable quality to justify the name, however in wider usage any corundum with a red or reddish colour has attracted the name 'ruby', and this name is usually applied in this way by mineral collectors. Pink corundum is usually referred to in gemmological terminology as pink sapphire rather than ruby. Pure Cr2O3 occurs in nature as the mineral eskolaite which is green. Visit gemdat.org for gemological information about Ruby. 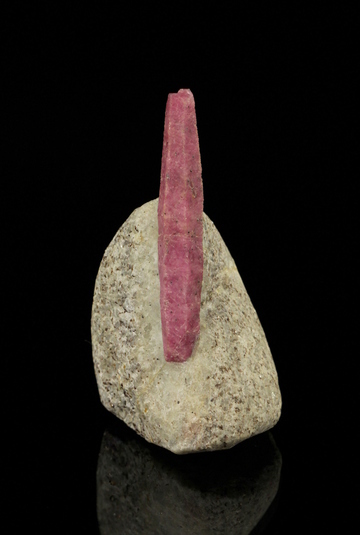 Barklyite A magenta-coloured variety of ruby (Corundum). Originally reported from Victoria, Australia. Star Ruby A variety of ruby exhibiting a star pattern when viewed down the c axis. The chatoyance is due to oriented microscopic inclusions (nanorods) of diaspore (Nadin, 2007). Trapiche ruby Variety showing six-spoked growth features. Pargasite 53 photos of Ruby associated with Pargasite on mindat.org. Zoisite 47 photos of Ruby associated with Zoisite on mindat.org. Calcite 30 photos of Ruby associated with Calcite on mindat.org. Phlogopite 27 photos of Ruby associated with Phlogopite on mindat.org. Sapphire 23 photos of Ruby associated with Sapphire on mindat.org. Painite 18 photos of Ruby associated with Painite on mindat.org. Mavinite 18 photos of Ruby associated with Mavinite on mindat.org. Muscovite 14 photos of Ruby associated with Muscovite on mindat.org. Rhodolite 14 photos of Ruby associated with Rhodolite on mindat.org. Fuchsite 11 photos of Ruby associated with Fuchsite on mindat.org. The following Ruby specimens are currently listed for sale on minfind.com. Kawakami, T., Grew, E. S., Motoyoshi, Y., Shearer, C. K., Ikeda, T., Burger, P. V., & Kusachi, I. (2008). Kornerupine sensu stricto associated with mafic and ultramafic rocks in the Lützow-Holm Complex at Akarui Point, East Antarctica: what is the source of boron?. Geological Society, London, Special Publications, 308(1), 351-375. [var: Barklyite] Liversidge, A. (1896) On some New South Wales and other minerals. The Chemical News and Journal of Physical Science, Volume 74:113-114 Sept. 4. McColl, D.H., Warren, R.G. (1979): The first discovery of ruby in Australia. The Australian Mineralogist, 26, 121-125.
ⓘ Penglai Gem deposit ? Wang Furui (1988): Gems & Gemology 24(3), 155-160. Yunkui Qian (2004): Yunnan Geology 23(3), 337-342; Dong Ye and Xueliang Liu (2006): Journal of Gems and Gemmmology 8(3), 21-24. Kotrlý, M., Malíková, P., Holub F. X. (1997) Malá Jizerská louka, klasické naleziště drahokamové asociace. Bulletin mineralogicko-petrografického oddělení Národního muzea v Praze, 1997, roč. 4-5, s. 25-40. Kotrlý, M., Malíková, P. (2002) Klasická lokalita Malá Jizerská louka. Minerál, 2002, roč. 10, č. 4, s. 251 - 262.
collected by Guy Pégère and François Périnet. PERINET F., PEGERE G. (2009) – Les sables éluvionnaires à rubis et sapphirine du secteur de Peygerolles, St-Privat-du-Dragon, Haute-Loire – Le Cahier des Micromonteurs, n° 104, pp. 35-41. BAISSIERES D. (2010) – Ma vallée des rubis… Viala-du-Tarn, Aveyron. Le Règne Minéral n°93, pp 67-69. Panebianco R. (1886-87): Berillo e altre gemme di Lonedo. Atti R. Ist. Ven. Sci. Lett. Arti, ser. 6, 5, 387-396; Boscardin M., Girardi A., Violati Tescari O. (1975): Minerali nel Vicentino. Club Alpino Italiano, Sezione di Vicenza, 144 pp. ; Boscardin M., Violati Tescari O. (1996): Gemme del Vicentino. Comune di Montecchio Maggiore, Museo Civico "G. Zannato", Montecchio Maggiore (Vicenza), 114 pp. ; Zordan A. (2014): Provincia di Vicenza. In: Zorzi F., Boscardin M. (eds. ), Minerali del Veneto. Alla scoperta dei tesori della nostra regione. Museo di Storia Naturale e Archeologia di Montebelluna - Treviso, Cierre Edizioni, Sommacampagna, 173-246. Mercier A., Debat P. & Saul J.M. 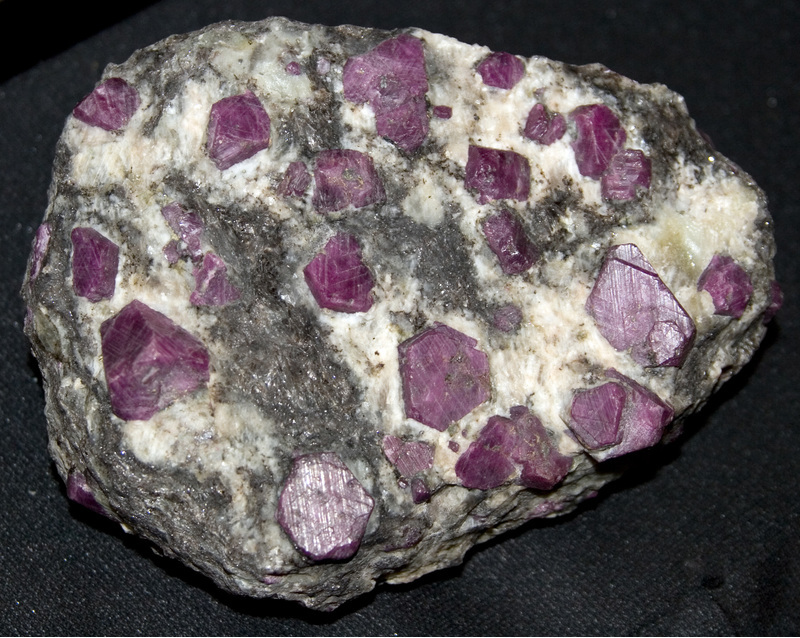 (1999): Exotic origin of the ruby deposits of the Mangari area in SE Kenya. Ore Geology Reviews, 14, 83-104. Giuliani, G., Fallick, A., Rakotondrazafy, M., Ohnenstetter, D., Andriamamonjy, A., Ralantoarison, T., Rakotosamizanany, S., Razanatseheno, M., Offant, Y., Garnier, V., Dunaigre, C., Schwarz, D., Mercier, A., Ratrimo, V., and Ralison, B. (2007): Mineralium Deposita 42, 251-270.; Peretti, A., FGG, F., & Hahn, L. (2012). Record-breaking discovery of ruby and sapphire at the Didy mine in Madagascar: Investigating the source. InColor Fall/Winter, 22-35. T.R.Yager: The Mineral Industry of Madagascar. US.Geological Survey Yearbook 2001, 201-204. Vincent Pardieu, Supharart Sangsawong, and Stanislas Detroyat (2015)Rubies from a New Deposit in Zahamena National Park, Madagascar, Gems & Gemology, Winter 2015, Vol. 51, No. 4. Giuliani, G., Fallick, A., Rakotondrazafy, M., Ohnenstetter, D., Andriamamonjy, A., Ralantoarison, T., Rakotosamizanany, S., Razanatseheno, M., Offant, Y., Garnier, V., Dunaigre, C., Schwarz, D., Mercier, A., Ratrimo, V., and Ralison, B. (2007): Mineralium Deposita 42, 251-270.; Giuliani, G., Fallick, A., Rakotondrazafy, M., Ohnenstetter, D., Andriamamonjy, A., Ralantoarison, T., ... & Ralison, B. (2007). Oxygen isotope systematics of gem corundum deposits in Madagascar: relevance for their geological origin. Mineralium Deposita, 42(3), 251-270. Giuliani, G., Fallick, A., Rakotondrazafy, M., Ohnenstetter, D., Andriamamonjy, A., Ralantoarison, T., ... & Ralison, B. (2007). Oxygen isotope systematics of gem corundum deposits in Madagascar: relevance for their geological origin. Mineralium Deposita, 42(3), 251-270. H.G. Dill, A review of mineral resources in Malawi: With special reference to aluminium variation in mineral deposits, Journal of African Earth Sciences, Volume 47, Issue 3, March 2007, Pages 153-173, ISSN 1464-343X, 10.1016/j.jafrearsci.2006.12.006. ; Dill, H. G., & Ludwig, R. R. (2008). Geomorphological-sedimentological studies of landform types and modern placer deposits in the savanna (Southern Malawi). Ore Geology Reviews, 33(3), 411-434.; Henn, U., Bank, H., & Bank, F. H. (1990). Red and orange corundum (ruby and padparadscha) from Malawi. Journal of Gemmology, 22(2), 83-89. Pardieu, V., Sangsawong, S., Muyal,J.,Chauviré, B., Massi, L. and N. Sturman (2013) Rubies from the Montepuez area (Mozambique). GIA News from Research October 12, 2013. Han Htun & George E. Harlow. Identifying Sources among Burmese Rubies. American Museum Natural History website accessed 7/3/2013; Aung, H. L., & Zin, T. T. (2017, November). Some Characteristics of Nanyaseik Area Corundum and Other Assorted Gemstones in Myanmar. In International Conference on Genetic and Evolutionary Computing (pp. 173-181). Springer, Singapore. ; Aung, H. L., & Zin, T. T. (2017, October). Nanyaseik ruby of phakant township, Kachin state, northern Myanmar. In Consumer Electronics (GCCE), 2017 IEEE 6th Global Conference on (pp. 1-2). IEEE. ; Aung, H. L., & Zin, T. T. (2017, November). Exploring Gemstones in Northern Part of Myanmar. In International Conference on Genetic and Evolutionary Computing (pp. 182-188). Springer, Singapore. Adams, F.D. and Graham, R.P.D. (1926) On some minerals from the Ruby Mining District of Mogok, Upper Burma. Transactions of the Royal Society of Canada, Section IV, 113-136.; Morris, N. (2005) Diamonds and other gems. Appleseed Editions, East Sussex. ; Doppler, G. (2010) Petrogenese und Geochemie von ausgewählten Korund (Rubin)-lagerstätten. Master’s Thesis, University of Graz, Austria, 140 pp. (in German); Harlow, G. E. & Bender, W. (2013) A study of ruby (corundum) compositions from the Mogok Belt, Myanmar: Searching for chemical fingerprints. American Mineralogist 98, 1120-1132. Ted Themelis (2008) Gems & mines of Mogok; Yui, T.-F., Khin Zaw, Wu, C.-M. (2008): A preliminary stable isotope study on Mogok Ruby, Myanmar. Ore Geol. Rev. 34, 192-199. Win, T.T., Davies, R.M., Griffin, W.L., Wathanakul, P. & French, D.H. (2001). Distribution and characteristics of diamonds from Myanmar. Journal of Asian Earth Sciences, 19, 563-577. Garnier, V., Ohnenstetter, D., Giuliani, G., Blanc, P., & Schwarz, D. (2002). Trace-element contents and cathodoluminescence of “trapiche” rubies from Mong Hsu, Myanmar (Burma): geological significance. Mineralogy and petrology, 76(3-4), 179-193; Doppler, G. (2010): Petrogenese und Geochemie von ausgewählten Korund (Rubin)-lagerstätten. Master’s Thesis, University of Graz, Austria, 140 pp. (in German). Grapes, R., Palmer, K. (1996) (Ruby—Sapphire)—Chromian Mica—Tourmaline Rocks from Westland, New Zealand. Journal of Petrology, 37(2), 293-315. Christie, T., Brathwaite, B., Thompson, B. (1993) Mineral commodity report 1-aluminium. Institute of Geological and Nuclear Sciences Ltd.
Jan, M. Q., & Khan, M. A. (1995). 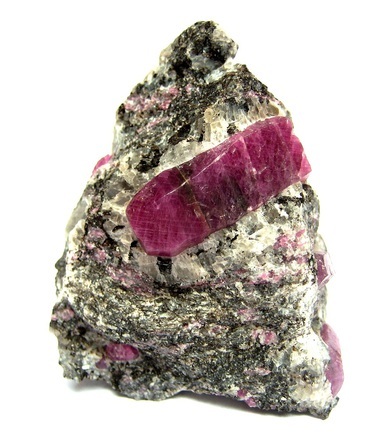 Potential For Ruby Mineralization In Upper Kaghan, Nw Himalaya. Journal Of Himalayan Earth Sciences, 28. Eligiusz Szełęg "Atlas skał i minerałów". Pascal 2007. LANKA, G. (1984). State Gem Corporation, Mount Lavinia, Sri Lanka. Non-Metallic Mineral Ores, 15, 343. Stalder, H. A., Wagner, A., Graeser, S. and Stuker, P. (1998): "Mineralienlexikon der Schweiz", Wepf (Basel), p. 242. Litvinenko A.K., Barnov N.G. (2010): The history of Pamirs gemstones. Izvestiya Visshikh Uchebnykh Zavedeniy, Geologiya Razvedka (Proceedings of Higher Educational Institutions, Geology and Prospecting), No. 4, 70–74 (in Russian). Elena S. Sorokina, Andrey K. Litvinenko, Wolfgang Hofmeister, Tobias Häger, Dorrit E. Jacob, and Zamoniddin Z. Nasriddinov (2015): Rubies and sapphires from Snezhnoe, Tajikistan. Gems & Gemology 51, 160-175. E.Ya. Kievlenko, Geology of gems, 2003, p. 51; Sorokina E.S., Ozhogina E.G., Jacob D.E., Hofmeister W. (2012): Some features of corundum ontogeny and the quality of ruby from Snezhnoe deposit, Tajikistan (the Eastern Pamirs). Zapiski RMO (Proceedings of the Russian Mineralogical Society), 141 (6), 100–108 (in Russian). ; Elena S. Sorokina, Andrey K. Litvinenko, Wolfgang Hofmeister, Tobias Häger, Dorrit E. Jacob, and Zamoniddin Z. Nasriddinov (2015): Rubies and sapphires from Snezhnoe, Tajikistan. Gems & Gemology 51, 160-175. Smith, C.P. (1998): Rubies and pink sapphires from the Pamir Mountain Range in Tajikistan, former USSR. Journal of Gemmology, 26, 103-109. Schmetzer, K., Radl, W. & Schwarz, D. (2009): Winza ein neues Rubinvorkommen in Tansania. Lapis 34 (5), 41-46. Hintze, J. (2011): Afrikanisches Tagebuch (III): Die Spinelle von Mahenge, Tansania. Lapis 36 (7-8), 26-30. USGS (2003) Minerals Yearbook - Tanzania. http://gemexplorer.org/archives/tunduru-tanzania; Macfarlane, M., Tallontire, A., & Martin, A. (2003). Towards an Ethical Jewellery Business. Natural Resources Institute, University of Greenwich, London. Jaroslav Hyrsl specimens; Henry Hanni (1987) On Corundums from Umba Valley, Tanzania. J. Gemm. 20:278-284.; Zwaan, P. C., & Zwaan, P. C. (1974). Garnet, corundum and other gem minerals from Umba, Tanzania. Rijksmuseum van Geologie en Mineralogie. Widely distributed in numerous collections. [var: Star Ruby] Gobla, M.J. (2012) Montana mineral locality index. Rocks & Minerals, 87, #3, 208-240. U.S Bureau of Mines,Spatial Data Extacted from the Minerals System/Mineral Industry Location System(MAS/MILS)CD-Rom,Sep,1995. Pham Van Long, Gaston Giuliani, Virginie Garnier, Daniel Ohnenstetter (2004) Gemstones in Vietnam. The Australian Gemmologist Volume 22, Number 4, October–December 2004; Nguyôn Kinh Quèc, Nguyôn Quúnh Anh () Aquamarine, Beryl And Possibility Of Finding Emerald And Alexandrite In Việt Nam. Generations, 41, 50-58. Le Thi-Thu Huong, Laura M. Otter, Tobias Häger, Tim Ullmann, Wolfgang Hofmeister, Ulrike Weis, and Klaus Peter Jochum (2016): A New Find of Danburite in the Luc Yen Mining Area, Vietnam. Gems & Gemology, 52 (4), 393-401. Pham Van Long, Gaston Giuliani, Virginie Garnier, Daniel Ohnenstetter (2004) Gemstones in Vietnam. The Australian Gemmologist Volume 22, Number 4, October–December 2004; Khoi, N.N., Sutthirat, C., Tuan, D. A., Nam, N.V., Thuyet, N.T.M. and Nhung N.T. (2011) Ruby and sapphire from the Tan Huong-Truc Lau area, Yen Bai province, northern Vietnam. 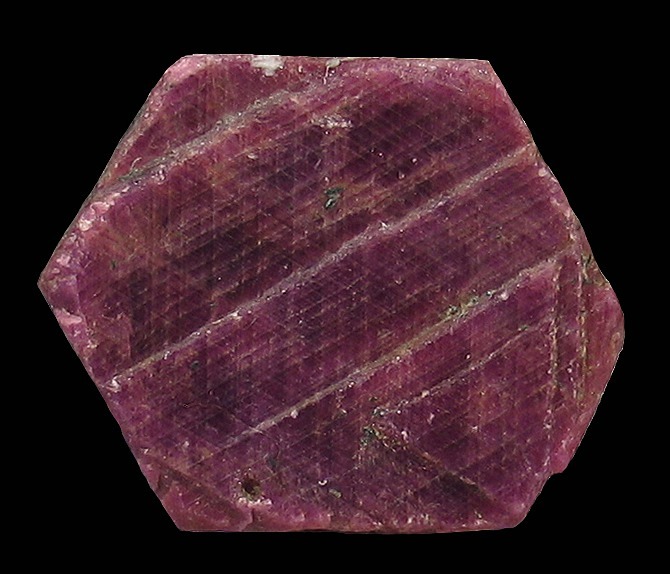 Gems & Gemol., 47 (3), 182–195. MUGUMBATE, R. OESTERLEN, P.M., MASIYAMBIRI, S. & DUBE, W. (2001): Industrial Minerals and Rock Deposits of Zimbabwe.- Zimbabwe Geological Survey Mineral Resources Series No. 27., Harare; 159 pages. Cairncross, B. (2004) Field Guide To Rocks & Minerals Of Southern Africa: 82.